It’s that time again, you know where your pants become snug and you realize that the dryer is not the culprit (SIGH). I mean my blog is fifty percent food, I have a job to uphold here (one I LOVE) and I never want to disappoint you, so I’m always searching for the next food recipe I will post or create. When it comes time to bunker down and eat healthier for a while I absolutely do not want to eat health foods, I want fresh foods! This Coodles and Roasted Tomatoes with Lemon Dill Dressing is just that, FRESH! Sure, you can call it health. Some would argue that cheese is healthy, but I personally think cheese, especially feta, is a gift sent straight from Heaven. Anything from Heaven is good for the soul, therefor cheese is healthy, 😉 everything in moderation is key of course. I love long walks with the kids in their stroller, when and if their behaving of course. Like most parents and care givers know, it only takes a million snacks and bribery with the park at the end of that walk. Well, my broken toe has halted these walks, resulting in a drop to my current mood and increase in waist size. To counter act those negative feelings of not being able to exercise I eat chocolate. Yup, I’m human and fall into that guilty pleasure of eating to feel better. Even if just for the moment, sometimes you just have to put on your fat pants and indulge, whatever keeps you going and smiling. It’s been a rough month with so many negative things in the media, not to mention my personal life has been handed a lot of ciaos to interject, but in life it’s all about keeping yourself smiling and grateful, for every difficult moment remember, you can change your path. Happiness is a state of mind and I while have not mastered being happy 24/7 yet, I have realized no matter what I’m going through, I will over come that difficult moment, I will smile again. Hold on to your spirits people, there will always be negative things to bring it down, but there are always a million things to bring it back up. 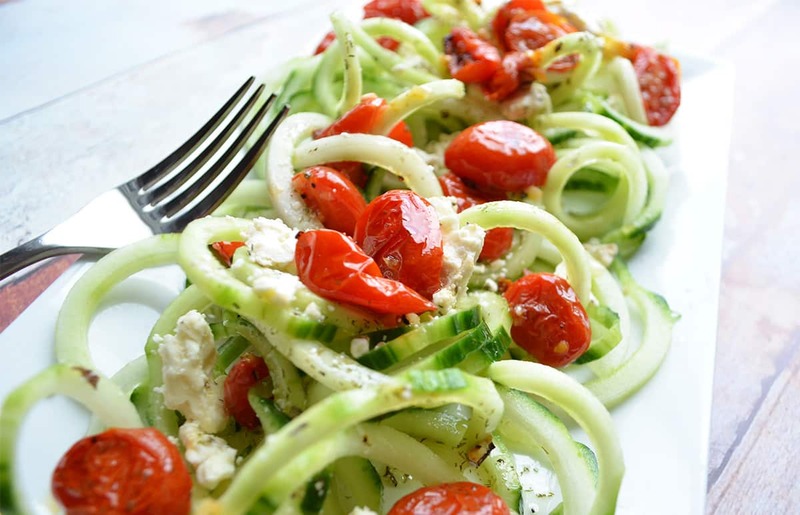 Warm Roasted Tomatoes with garlic, on top of crunchy fresh coodles (cucumber noodles), with bites of Mediterranean feta, all drizzled with lemon dill dressing…A EXEMPLARY WAY TO ENJOY EATING LIGHT AND FRESH!